When 18-year-old Brazilian forward Vinícius Júnior was signed to Real Madrid on a €45 million transfer this summer, there was probably some expectation on his end that his footballing life would change for the better. To a certain degree, it has. He’s been getting regular training reps in with the first team—featuring the likes of Gareth Bale, Sergio Ramos and Luka Modrić—but most of his game appearances have been with the reserves in the Spanish third division, Segunda División B. His most recent game with Real Madrid Castilla—the club’s reserve team—might be his most memorable one so far. Not only did he score two goals in an eventual 2-2 draw, he was also bitten in the head. No. 4 is Cristian Rodriguez Perez, a midfielder for Atletico Madrid’s reserve team, and the captain of his side. 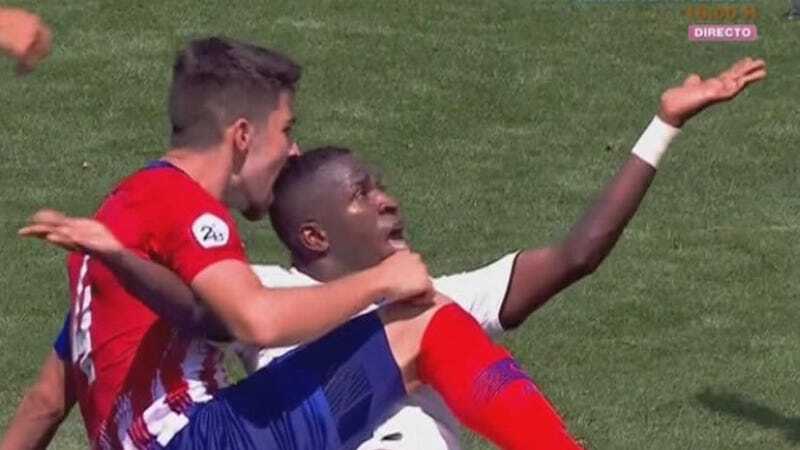 One would think that such an infraction would be worthy of a red card, but that would make too much sense for these officials. Both Vinícius and Perez were given yellow cards for the scuffle.